40 Dundas Street hasn’t been graced by a flat name for more than ten years. It appears we now have a proud Samoan Embassy in Dunedin North! The last recorded name for this flat was the infamous “Greasy Beaver Lodge”. The (unconfirmed) word on the street was the then landlord banned further naming. 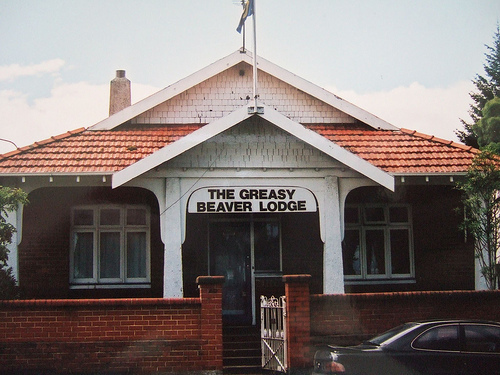 The Greasy Beaver Lodge will live on in the record of NZ art history however, as it was one of the many named flats in Dunedin that inspired artist, Scott Eady‘s Frances Hodgkins Fellowship in 2002. A reinterpretation of The Greasy Beaver Lodge sign featured in Scott Eady’s exhibition “Signs” at The Blue Oyster Gallery in 2002. The sign currently resides in the Hocken Collections (record). The Greasy Beaver Lodge reappeared in April 2016 shortly after 40 Dundas Street was sold.